I just caught up on some news of a free giveaway contest that should interest you if you’re a Fender amp fan. 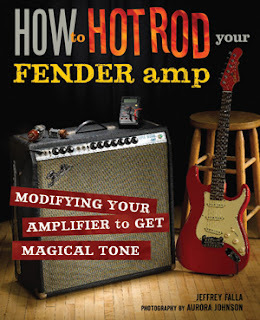 Voyageur Press is giving away five copies of its book How to Hot Rod Your Fender Amp, which shows you details of various modifications to get the best sound possible out of your amp. The book is written by Jeffrey Falla, a man who knows a thing or two about guitar amps. Jeffrey modified his first amp at the age of 13 and soon after built his first amp from parts he salvaged from old jukeboxes. Today he builds ToneTron amps for a small clientele and spends most of his time experimenting with sound in his Minneapolis workshop. You have until midnight on January 30th to enter, so hurry over to the Voyageur Press Contest Blog to enter.